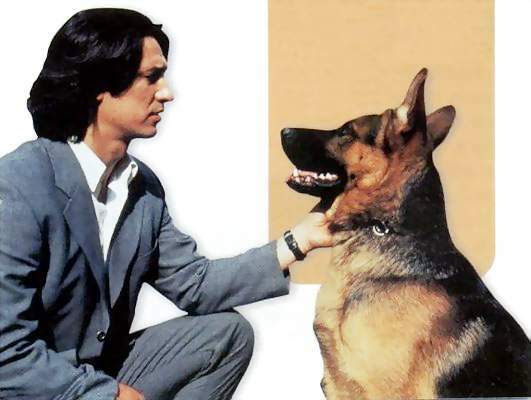 Let Sleeping Dogs Lie: Are You Ready for REX? Global companies - particularly those using Amber Road’s software solutions - know that only with a superior system that deciphers complex terms, coverage and rules of origin for trade agreements can they leverage substantial costs-savings, whilst maintaining highest levels of compliance. Therefore, it comes as no surprise that these leading global players have been buzzing with questions on the recently adopted Registered Export System (REX). The constant changes in economical, technological, and political circumstances makes it necessary for the EU to be as current as possible when it comes to dual-use export controls in order to preserve international peace and security. For this reason, and in order to comply with its international security obligations, the EU dual-use control list included in Annex I to the Regulation (EC) No. 428/2009 needs to be updated regularly. 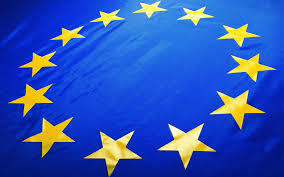 On November 15, 2016, the European Commission formally published the amended Council Regulation on the control of exports, transfer, brokering and transit of dual-use items. The EU Commission had already adopted this on September 12, 2016, however publication in the Official Journal of the EU could not occur until after the EU Parliament and EU Council’s 2-month period of veto powers had passed. This 2016 update of the EU Control List of Dual-Use Items concern, in particular, the current list of dual-use items, specifically those in Annexes I, IIa and IIg of EC No 428/2009, as amended. The regulation entered into force the following day on November 16, 2016. The EU Commission has published a “Comprehensive Change Note Summary 2016”. 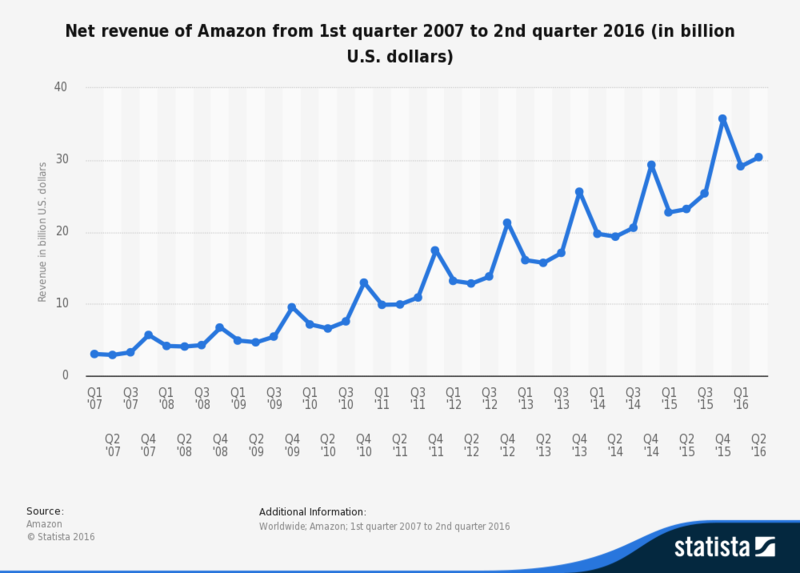 Amazon.com has dominated the eCommerce industry since 1995, originating as an online reseller of books. During Amazon’s first month in business, it received orders from customers in 50 U.S. states and 45 countries across the world. Today, the company offers over 183 million products and serves more than 224 million customers. The EU has an extensive dual-use industry that brings together thousands of small, medium, and large-sized companies that provide highly valued jobs and know-how, including significant R&D work. According to the European Commission, dual-use items are often high-tech products and have ramifications across a wide range of key sectors of the EU economy; they include leading edge technologies that are crucial to the EU's drive towards innovation and competitiveness. In 2014, the total value of controlled dual-use exports reached EUR 59 billion, representing 3.4% of total EU exports to third countries. Few exports were actually denied, representing a negligible portion of total EU exports. 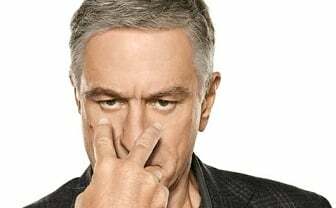 “I’m watching you.” Just as Robert De Niro warned Greg Focker in Meet the Parents, Fokker Services should have realized that the U.S. government was watching too. By doing so, it could have avoided a $21 million fine for exporting U.S.-made goods to Iran, Sudan, and Burma in violation of trade sanctions. Fokker Services, a subsidiary of the Dutch aerospace company Fokker Technologies Holding BV, admitted to more than 1,100 shipments of banned aircraft parts, technology, and services to sanctioned countries between 2005 and 2010. The $21 million fine represents the value of these transactions. 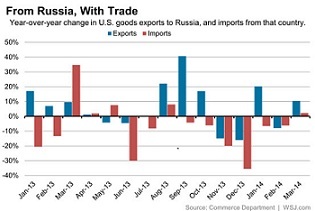 Surprisingly, U.S. trade with Russia grew in March, despite rising tensions and Russia’s annexation of Crimea. According to the Commerce Department, exports of U.S. goods to Russia rose 9% from the prior month, and imports from Russia rose 36%. The U.S. tends to import Russian oil, metals and fertilizers and export machinery, vehicles, and food. March’s trade increase can largely be attributed to a surge in exports of civilian aircraft and autos. Talk about a Cuban Export Crisis….CWT B.V., a Dutch travel agency, has been fined $5.9M by the U.S. government for violating the trade embargo to Cuba. CWT’s violations took place from August 8, 2006 to November 28, 2012 and involved trips to Cuba by 44,430 people. But why, you might ask, is a Dutch company getting fined by the U.S. government? In 2006, CWT became majority-owned by U.S. entities and thus subject to the U.S. Trading With the Enemy Act. CWT continued doing business with Cuba, but without obtaining the necessary licenses issued by Treasury’s Office of Foreign Assets Control (OFAC). The camaraderie of last month’s Sochi Winter Olympics seems to be a fleeting memory as relations between the U.S. and Russia continue to deteriorate. In its latest response to Russia’s annexation of Crimea, the U.S. announced that it has imposed a ban on the issuance of export licenses for defense items and services to Russia. The State Department halted licensing on Monday, while the Commerce Department suspended licensing on March 1st. The Commerce Department will halt sales of software, electronic devices, optical sensors and cameras, which were all among the $1.5 billion worth of exports to Russia licensed in 2013. Of that $1.5 billion, $798 million were for detonators and $367 million were for software products. Other products included encrypted software, ammunition for firearms, spacecraft, and chemicals. 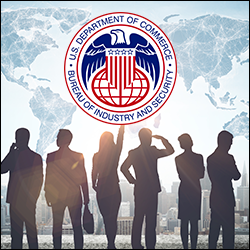 We know that keeping up with Export Control Reform (ECR) changes can be tough, so we’re breaking down the latest updates for you right here! 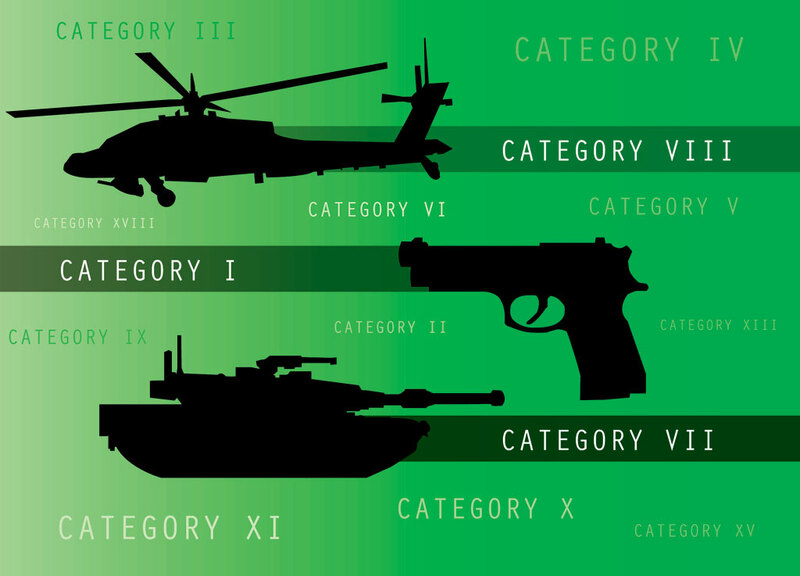 Get Caught Up: To date, 13 of the 21 categories on the U.S. Munitions list have been modified. 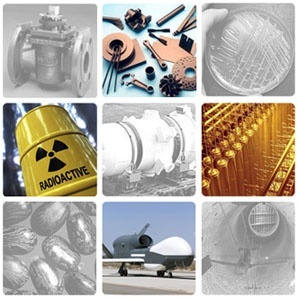 These items include aircraft, explosives, gas turbine engines, missiles and military vehicles, which combined account for approximately 90 percent of all export licenses.